Kettlebell Sport is unique. Thats why equipment for KB sport has unique specific design and specific functions. This 3 Layer Belt is made in the home of Kettlebell Sport, Saint Petersburg, Russia, the center of the kettlebell world. In Rack Position sportsman leans body backwards to obtain more effective relaxation of quads and the lifter needs secure protection. The main specific function of Belt is to ensure full transfer of power while performing Jerk-phase after 1st Dip. In Rack Position sportsman leans body backwards to obtain more effective relaxation of quads, also the lifter needs secure protection of lower back from fatigue injuries and pain. LOCAZ Belt has unique design to provide you with this effect. Also solid platform gives you so necessary rest for arms and shoulders and gives you MORE REPS! 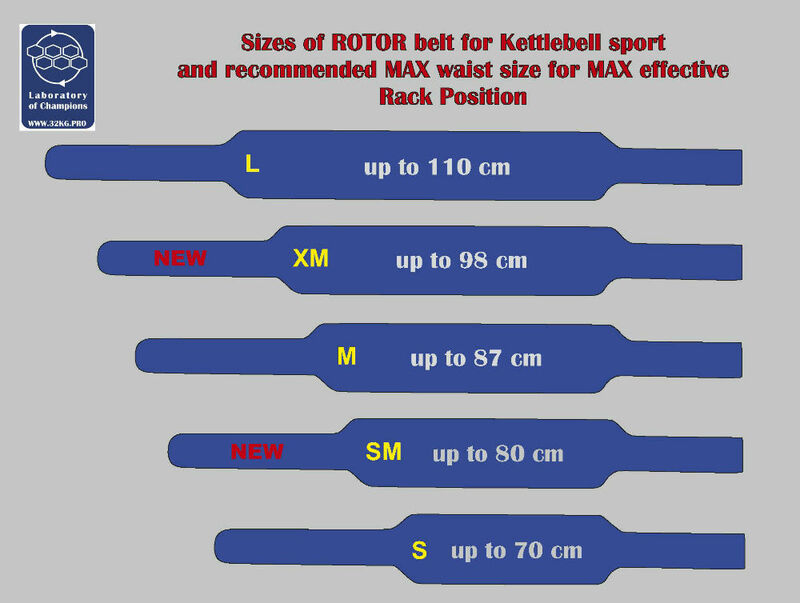 Kettlebell Belt is a very specific belt. The belt is very firm and rigid. You have to do turn the ribs of the belt out and press it making it more oval. Lean athletes shouldnt buckle the belt tight. The criteria - elbows have to reach the edge of belt and have rest there. Test it with Kettlebells only. Without KB the test will be incorrect. Bigger athletes may buckle it tight to make "belly platform" and place forearms on belly's surface. Unique specific design from Honored Master of Sport of Russia Arseny Zhernakov pro-grade belt for Kettlebell sport and CrossFit. 3-layer of genuine thick leather. The width 12cm (IUKL Regulations are conformed). Provides excellent support for elbows and spine safety in Rack Position for Kettlebell lifts or CrossFit events. Unique Asymmetrical ROTOR design of M-size fits all your changes by rotation. Basic color is dark brown.